and constructed using beautifully decorative burr and figured walnut. 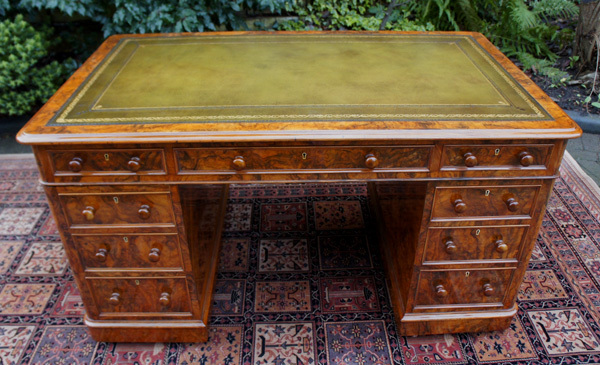 The desk has a replacement green hide writing surface with gilt and blind tooling. 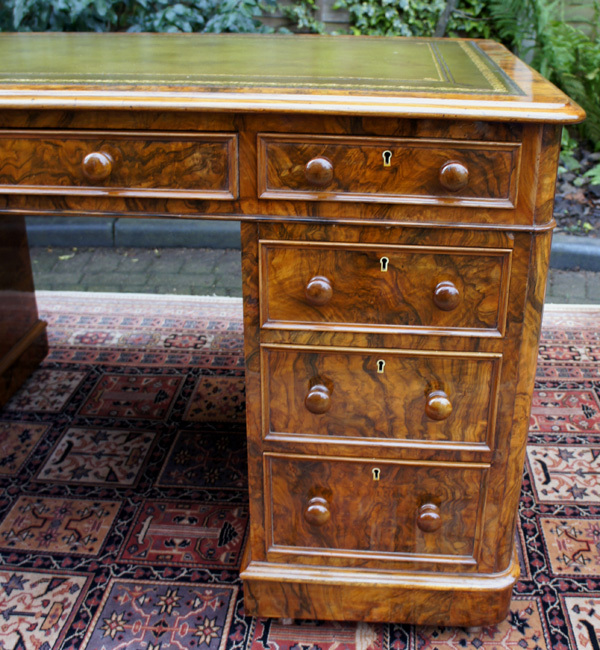 This is surrounded by a band of beautifully figured walnut with a thumb moulded edge and rounded corners. The desk is made in three sections for ease of transportation and installation. The top has tree drawers and each pedestal also has three drawers. and constructed using beautifully decorative burr and figured walnut. 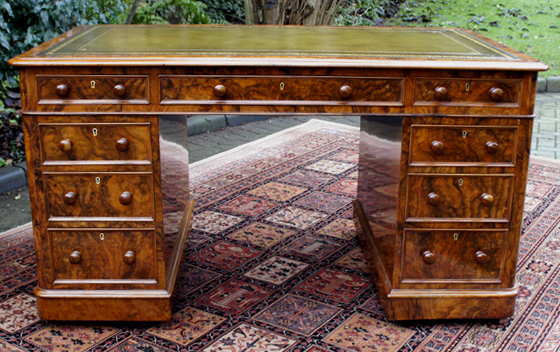 The desk has a replacement green hide writing surface with gilt and blind tooling. The desk is made in three sections for ease of transportation and installation. The top has tree drawers and each pedestal also has three drawers. The drawers are constructed with hand cut dovetail joints and the original brass locks. The drawer fronts are trimmed with an 'ogee moulding' and turned wooden knobs. a wonderful honey colour and striking figured walnut veneers. It is in excellent condition and has recently been professionally cleaned and re-polished ready for use in an office or study area. The central drawer is stamp marked *Edwards and Roberts Wardour Street London. *Notes: Edwards and Roberts were founded in 1845 with premises at 21 Wardour Street London. as well as good copies of the 18th and 19th century English and French furniture.